Namaste, and welcome to our website, through which we endeavor to provide accurate, useful and contemporary information on Hinduism. Clearly our broadest reaching digital initiative is our five-part “History of Hindu India” YouTube video series. The pace of the addition of new viewers is impressive. Part One has added an impressive 750,000 views over the last twelve months to reach its current total 2.2 million views. The more recently added Parts Two and Three each have an over a million views. Clearly the series is fulfilling a need for accurate and well-presented information on Hinduism’s history. Parts Four and Five of the series are almost complete and will be posted to YouTube in the months ahead. For our quarterly magazine Hinduism Today, a major task accomplished is the new and improved HT mobile app. One of its valuable features is that when opened on a smart phone the app defaults to the text version and thus is immediately readable. Other accomplishments include a redo of the Publisher’s Desk archives to present all the articles in chronological order. Also starting with the July 2017 issue the video and the recorded keynote have been combined into a one movie with a professional opening and closing section. For our digital resources on Saivism, much of our professionals’ time during the year was devoted to the SivaSiva mobile app. The app provides mobile access to a wealth of material on Saivism for individual of all ages, has gone through beta versions and was recently released to the world. We also reorganized the presentation of the Saiva Agama documents and updated them to include the most recent translation work received from India. Our Gurudeva, Sivaya Subramuniyaswami, envisioned all the material on our websites and now our new mobile apps as well to be available for free online. However, to upgrade and expand our digital initiatives we do incur significant professional fees. To cover this expense we follow the model of Wikipedia and ask for donations during the last few months of the year. For seven years running, you have responded generously, and after another year of working to enhance the site, we are back again with this appeal. In our “How Your Donations Were Used,” we detail what we did with your past generosity. Your contribution this year will go to the enhancement of our websites and their content and the development of mobile apps. A portion of this DDD will again be used to pay down the construction loan taken to complete the renovation of the Media Studio. The funds do not pay staff salaries or administrative overhead, since these sites are created and maintained by selfless monks who work for free and live simply in our remote monastery on the island of Kauai. 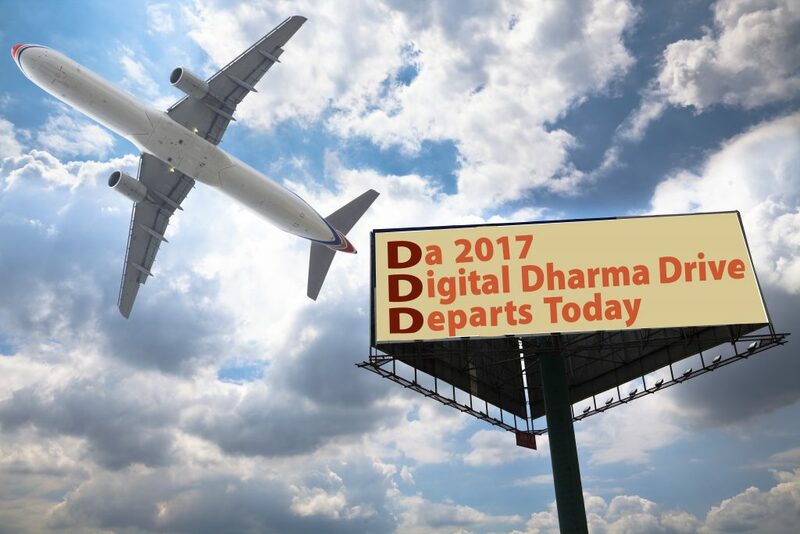 Ten percent of your tax-deductible contribution goes into the permanent Digital Dharma Drive Endowment, which now stands at $115,000 after seven years of fundraising. This follows Gurudeva’s vision that all major aspects of our work ultimately be supported by endowments. As that endowment accumulates, it will provide an ever-increasing income for decades to come, protecting the digital future of Hinduism, your religious heritage. Donate today, and improve our presentation of Hinduism to the world—for the benefit of this and future generations. This entry was posted on Tuesday, October 31, 2017 at 7:52 pm and is filed under Monastery. You can follow any responses to this entry through the RSS 2.0 feed. You can skip to the end and leave a response. Pinging is currently not allowed.